They say that memories are the fuel that people burn in order to stay alive. Without the power of remembrance, our existence would be dull and flat. How else can we learn from our mistakes and triumphs? With the lessons from the past, those good and bad, we are enabled to keep on enduring and living despite the innumerable challenges in life. We strive to move forward and reach greater heights as the pain of past failures makes the possible attainment of victory even sweeter. We can’t afford to lose this vital mental capability. Good thing is that there are herbal plants like ginkgo biloba which makes our minds replenished through time. ATC Healthcare International Corp. sought out the best ginkgo biloba out there to fit into one convenient capsule – ATC Ginkgo Biloba. ATC Ginkgo Biloba is the brain enhancer you need to keep your memory sharp. ATC Ginkgo Biloba is a food supplement mainly made of gingko biloba and maiden tree extracts. These two extracts are known to help sharpen the memory and has been used since the early periods of history as food and a traditional medicine. Ginkgo Biloba, to be found in ATC Ginkgo Biloba, is believed to be one of the most effective herbal plants that is used for the management of memory loss and improvement of cognitive functions and primary senses. Aside from its brain enhancing capabilities, Gingko Biloba is also helpful in regulating blood flow to the brain thus lowering the possibility of having Stroke. It is also capable of protecting and healing damaged cells that are caused by inevitable diseases such as Alzhiemer’s and Glaucoma. Not to mention, it can also help in alleviating mental depression and mood disorders. For just SRP P6.00 per capsule, retain the power of your mind with ATC Gingko Biloba. Take ATC Ginkgo Biloba every day and take the world by storm through the innate gift of knowledge that you possess. 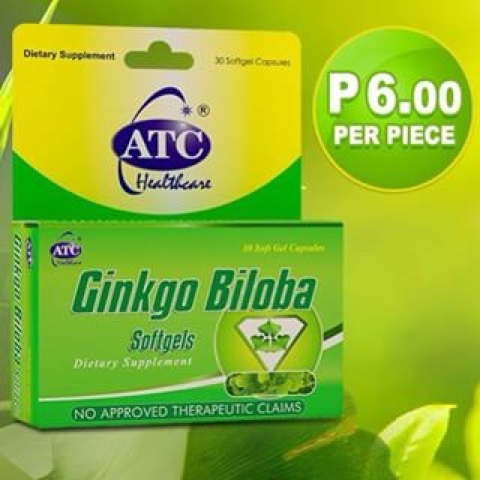 ATC Ginkgo Biloba is available at Mercury Drug and other leading drugstores nationwide.